This poorly paced thriller, which has obviously sat on the shelf for two years, sees Maryann (the excellent Natasha Calis from The Possession) move in with her grandparents after the death of her parents. Feeling isolated, Maryann goes for a walk and is overjoyed to discover a young boy named Andy (Tahan) lives in the nearest house. 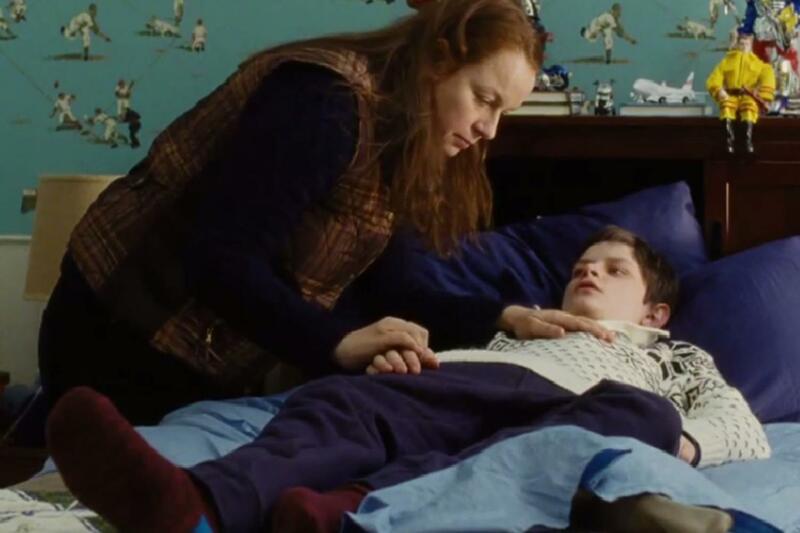 Andy is very ill however, and his overprotective mother, Katherine (Morton) does not allow visitors. At first, Maryann visits in secret, climbing through Andy’s window when his parents are out. When Katherine eventually discovers that Maryann has secretly been in the house in her absence, she becomes erratic. Maryann soon discovers why Andy’s mother doesn’t want her to visit. With devastating consequences. Now Maryann must try and help her friend from a terrifying fate, but who do you turn to when all of the adults in your life don’t believe you? The fact that John McNaughton directed this, coupled with such an impressive cast, meant I was sure I would be in for a real treat as I sat down to watch this. Sadly, despite everyone’s best efforts, the end result was akin to something you’d find playing late at night on Movies 24. Despite the aforementioned pacing (I was at the 45 minute mark before anything thrilling happened) and questionable editing, my biggest problem with this was Samantha Morton’s over the top portrayal of an unhinged mad woman. It was reminiscent of that time French & Saunders did Stephen King’s Misery. Michael Shannon was much better here as a concerned father caught in the crossfire, but the younger cast members, especially Calis are the central figures in this show and the real ones to root for. Can’t Come Out to Play (or the much more apt The Harvest as it was originally known) has a decent story at its core but poor editorial and story choices hamper it’s impact at every turn. Even the score confirms it’s suitability as Movie of the Week material. John McNaughton’s credits speak for themselves. Henry: Portrait of a Serial Killer and Wild Things are two very fine films. I can even imagine why on a script level, he’d have been interested in this project, but it doesn’t come together quite as well as I had hoped it would. In the end, the film is an alright timewaster. It does attempt to keep you guessing and on one level succeeds. It’s just a shame that it takes so long to do so, that you’ll have given up caring by the time it and its characters literally limp towards its conclusion. My partner sat down to watch this with me knowing nothing about it and actually had to ask me what genre it belonged to 20 minutes in, which is never a good thing. It’s not the worst film I’ve ever seen, but there’s nothing that makes it stand out from about 20 other movies you’ll have seen before, which is likely the reason it’s taken two years to see release. I still don’t know who or what is to blame, but this is obviously one of those films where for whatever reason, things went awry and the project couldn’t be saved. Can’t Come Out to Play is out on DVD and digital download on 22 June.